On to the review! 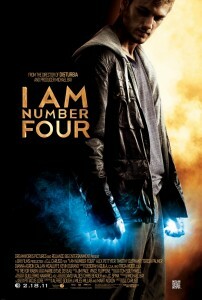 Number Four is the main character of this teen sci-fi movie. 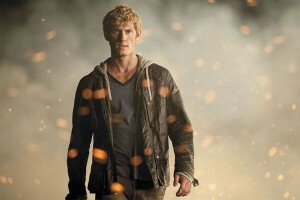 Alex Pettyfer is Number Four, or rather as his new identity states, he is John Smith. He is apparently an alien with superpowers (that is powers that aren’t normal for their kind) and he and 8 other such children were rescued from their planet where the evil aliens (their actual names are irrelevant, really) killed all the good guys. So now, it’s just the 9 children and their guardians. John’s happens to be Henri, played by the always delightful Timothy Olyphant. So Number Three is killed in the very beginning, and apparently these wonder children have a psychic connection because John knows what’s up. The two (that is, John and Henri) move to a dismal little town in Ohio where Henri “has business”. So this is where they hide. To keep busy John goes to school. He sees an artsy girl….. and then the movie becomes a teen coming of age film minus the previously promised science fiction elements. Sure there’s the constant threat of Evil Aliens, but for John, the attractive “outcast” artsy girl and her psycho football playing ex-boyfriend are his major concerns. It’s at this point that the movie really drags. It is scene after scene of their blossoming high school romance. I have nothing against such movies, but these scenes really dragged down the pace of the movie, and it was not what I had gone to see. They did the whole “high school romance blossoms” thing. For a loooooongg time. The mystery of the aliens, sure it’s cool, but it seems like it took a backseat to the plot of the film. The action scenes when John finally got his head around the truly important matters (ie. Evil Aliens) and the arrival of Number Six (played by Teresa Palmer), which finally got the plot moving right along, were really well done. The effects were pretty cool as well, especially Number Six’s firey, spinny thing that she does. I suppose John’s befriending of the local nerd deserves a mention, seeing as the boy’s father was an amateur alien hunter. Everyone laughed at him and then he was RIGHT!!! The story of my life. Well, not really, but my point is made. I thought it was odd how the superchildren all had several superpowers. I guess giving each one of them just one power wasn’t giving them enough of a chance to survive against an entire Evil Alien race. The movie climaxes with an epic battle. Don’t complain, that isn’t a spoiler in any way, shape, or form. And then the movie kind of ends. John does an inspirational, hope for the future but a big battle is on the way, type voice over and the film ends on a cliffhanger, clearly setting up for a sequel. Such a set up though, leaves a lot of unanswered questions, some of which I believe should have been addressed in this installment. Walking away, feeling like a badass. Despite all this harping on the movie, I really enjoyed it, even though it was really slow in the middle. The mystery is interesting and I would definitely like to see a sequel. If nothing else, it would be to stare at Alex Pettyfer’s sculpted anatomy.